Natasha explains in the video that successfully transforming your classroom space means involving your students and making them part of the change. This helps ensure that the space truly reflects the needs of the adult learners and creates spaces that are designed to support the learning needs of all students. Flexible learning spaces are not just about teachers re-designing classrooms to make them look more appealing. What about the role of technology? I asked Natasha whether technology becomes a distraction with her adult learners in a flexible learning space. Natasha explains that the role of technology changes and also becomes more flexible! See more of what Natasha has to say about technology and flexible learning spaces in this video clip. Other classrooms: I also spoke with Carmen Bodmer-Roy and Jason Jourdenais. Carmen and Jason are teachers at the Place Cartier Adult Education Centre with the Delta Program. They are also going through the process of transforming their classroom. One important take away from the discussion I had with Jason and Carmen is around expectations when starting a flexible learning space. Both teachers agree that one shouldn’t expect to completely transform your classroom in a matter of days. It may take time and the changes may evolve over weeks. These are great examples of teachers transforming their learning spaces and using the principles of UDL to transform their classrooms. Are you doing any of this in your adult education classroom too? If so, Tracy and I would love to hear about it. Please contact us. Thanks! 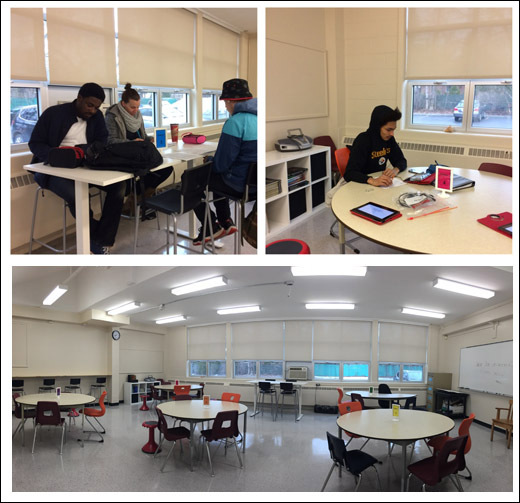 Place Cartier also recently transformed an entire room into a flexible learning space that’s shared by the entire school. The open setup of the room lends itself well for learning to be done in stations. To learn more about how our teachers are using stations in adult education, please visit our PD Mosaic tile on Learning in Stations. Thanks to Natasha Bellows, Carmen Bodmer-Roy, Jason Jourdenais, Myriam Rabbat + the team at Place Cartier for the interviews and for the pictures! 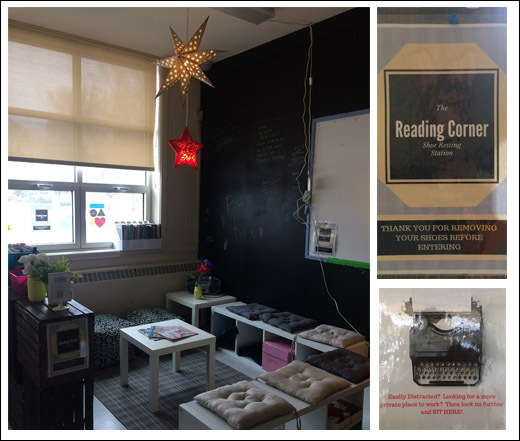 This entry was posted in In the Classroom and tagged carmen and jason, delta program, flexible classroom spaces, flexible learning spaces, natasha bellow, place cartier, udl. Bookmark the permalink.